Photograph captioned by BeckerFraserPhotos, "Pages Road". 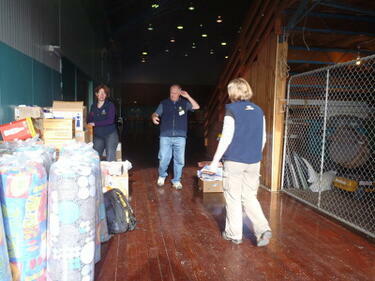 A photograph of volunteers from the Wellington Emergency Management Office unpacking supplies in Cowles Stadium. 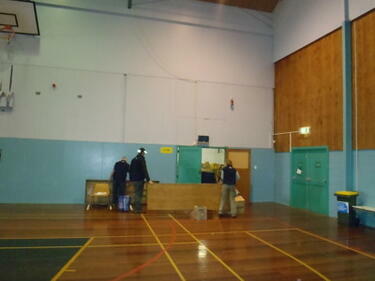 The stadium was set up as a Civil Defence Report Centre after the 4 September 2010 earthquake. A photograph of a kitchen with food and drinks for the emergency management personnel at a temporary Civil Defence headquarters. 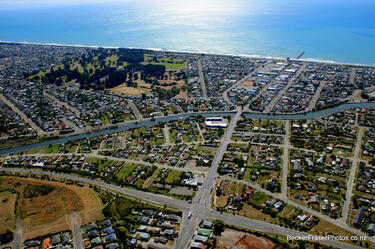 The headquarters was set up at the Mainland Foundation Ballpark after the 4 September 2010 earthquake. 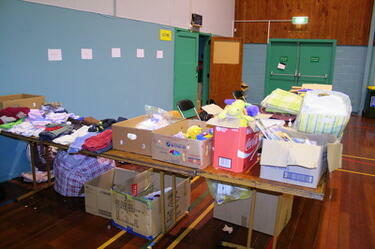 A photograph of a table in Cowles Stadium, full of books, clothes and toys for refugees from the 4 September earthquake. 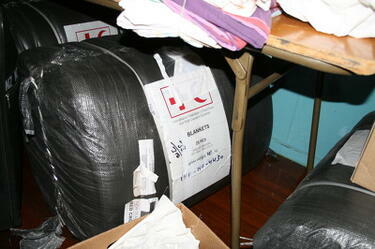 A photograph of a package full of blankets from the International Federation of Red Cross and Red Crescent Societies, sitting under a table in Cowles Stadium. The stadium served as temporary accommodation for refugees from the 4 September earthquake. 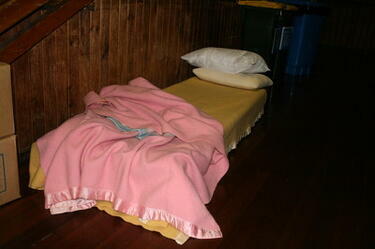 These blankets were given to people whose belongings were destroyed or unreachable. 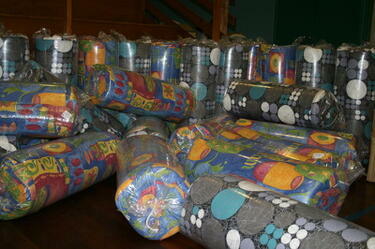 A photograph of mattresses in Cowles Stadium, still in their plastic wrapping waiting to be unwrapped. 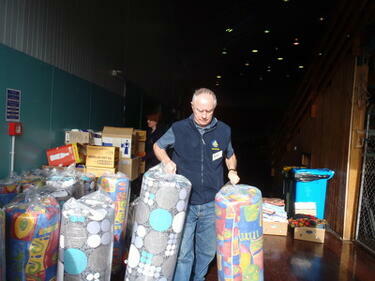 The stadium was set up as a Civil Defence Report Centre after the 4 September 2010 earthquake and the mattresses were to be used as beds for those displaced by the earthquake. A photograph of a stretcher with blankets and pillows sitting in the corner of Cowles Stadium. 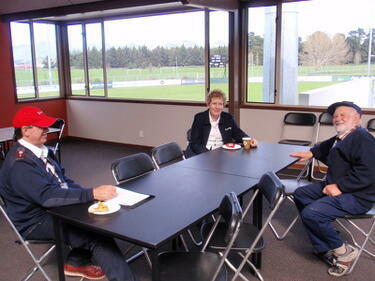 The stadium was set up as a Civil Defence Report Centre after the 4 September 2010 earthquake. 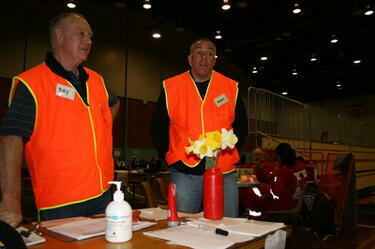 A photograph of Ray Whelan and Mark Osborne, from the Wellington Emergency Management Office, standing at a registration station in Cowles Stadium. The stadium was set up as a Civil Defence Report Centre after the 4 September 2010 earthquake. In the background, members of the Red Cross can be seen. 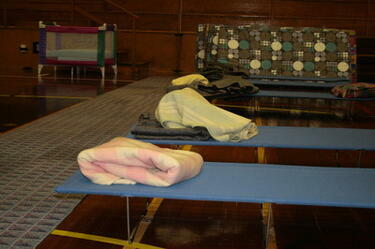 A photograph of stretchers and blankets set up in Cowles Stadium for people displaced by the 4 September earthquake. 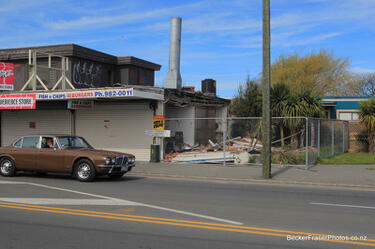 In the background a stack of mattresses and a cot can be seen. A photograph of a stretcher with blankets and pillows sitting in the corner of Cowles Stadium. 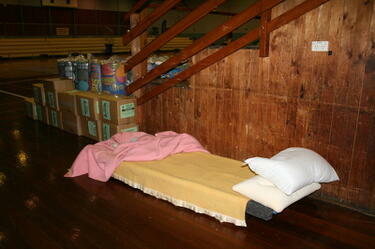 In the background, boxes full of supplies from the Red Cross and wrapped-up mattresses can be seen. The stadium served as temporary accommodation for refugees from the 4 September earthquake. 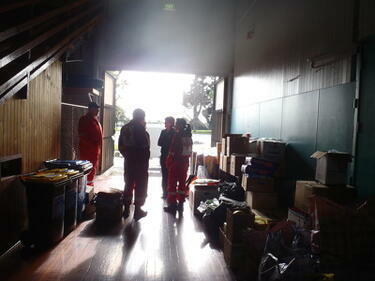 A photograph of members of the Red Cross and the Wellington Emergency Management Office organising supplies and temporary accommodation in Cowles Stadium for refugees from the 4 September earthquake. 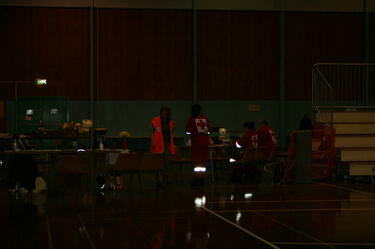 A photograph of members of Red Cross in Cowles Stadium on Pages Road. The stadium was set up as a Civil Defence Report Centre after the 4 September 2010 earthquake. 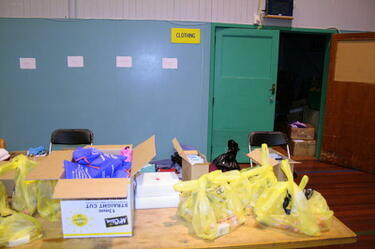 Boxes of supplies are stacked against the wall to the right. A photograph of volunteers from the Wellington Emergency Management Office setting up a table in Cowles Stadium on Pages Road. 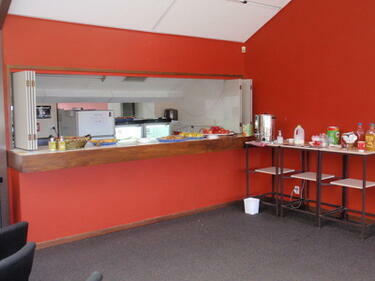 The stadium was set up as a Civil Defence Report Centre after the 4 September 2010 earthquake. 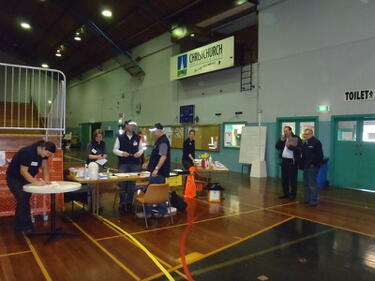 A photograph of volunteers from the Wellington Emergency Management Office at the canteen set up as part of a temporary Civil Defence headquarters after the 4 September 2010 earthquake. The headquarters was set up at the Mainland Foundation Ballpark on Pages Road. A photograph of workers from ADT Security sitting outside the temporary Civil Defence headquarters set up at the Mainland Foundation Ballpark after the 4 September earthquake. A photograph of volunteers from the Wellington Emergency Management Office working at the reception area of Cowles Stadium on Pages Road. The stadium was set up as temporary accommodation for those displaced by the 4 September 2010 earthquake. 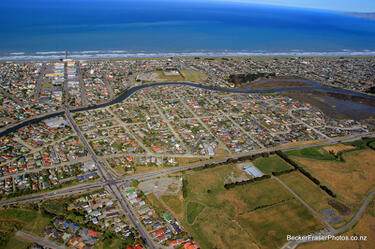 To the right Tim Shadbolt, Mayor of Invercargill, is talking on a telephone.